The centerpiece of this year's Munich Opera Festival is undoubtedly the new production of Lohengrin. It features a stellar cast led by German tenor sensation Jonas Kaufmann in his first assumption of the title role, which he is scheduled to reprise in Bayreuth next year. 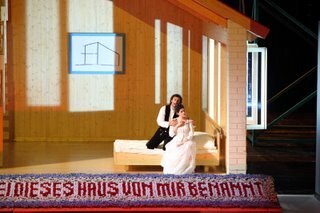 Kaufmann is partnered by the fast rising Greek-German soprano Anja Harteros in her first Elsa. The stage director is Briton Richard Jones, who has a long list of cutting edge productions to his credit. 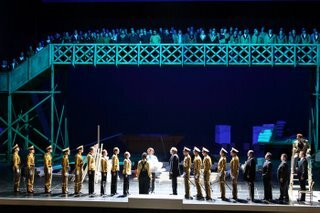 My own experience of Jones's work is limited to the Queen of Spades at the COC four years ago (originally staged for WNO), Lady Macbeth of Mtsensk at ROH, as well as Hansel and Gretel at the Met (also originally staged at WNO). To my eyes, the Tchaikovsky and Shostakovich are successes, but I find his vision of the Humperdinck excessively dark. When it comes to the musical side of things, one can be assured of excellence in the Bayerisches Staatsorchester under Kent Nagano. So it is no wonder that this Lohengrin is the most highly anticipated event of the summer. Tickets were sold out months in advance. In the performance I attended on July 8, I saw more people than usual milling about in front of the National-Theater before the show, holding up 'Suche karte' signs. Thanks to the Oper fur alle program, over 10,000 people got to experience the July 5 opening al fresco and for free, in Max-Joseph-Platz. The weather was threatening all day, and it did rain a little during Act One. The faithful stuck around and finally the they were rewarded with sun and dry weather to go with the magnificent singing for the rest of the evening. How to describe the production? Upon entering the theatre, one sees flyers being handed out with the photo of a child, with the word "Vermisst" (missing) printed on top. A few of these are even pasted inside the auditorium. It doesn't take long to figure out the child in question is Gottfried, Elsa's brother. With the first strains of the prelude, Elsa stands with her back to the audience, in front of a vertically placed drafting table, designing what appears to be a house. In fact the house metaphor figures prominently throughout the opera. It is obvious that Jones has a singular vision in his re-interpretation of this most beloved of Wagner operas. His concept may be well thought out, but its execution I find problematic. If one is looking forward to a glamorous and Romantic production, he/she will have to look elsewhere. There are no pretty scenary and little hint of nature. Also problematic is the way the characterization of the leads. Dressed in track pants and a blue T shirt, this Lohengrin is a common man - albeit one who hangs out with a mechanical swan - someone who longs to settle down with Elsa into a middle-class existence, making babies in a suburban house with a nicely planted flowerbed. The two spend a lot of time building their dream home onstage, but a house without a proper foundation isn't going to withstand evil winds. When the doubting Elsa can't hold her tongue anymore on wedding night, their dream of a life together is dashed. But who could have anticipated that this Lohengrin would douse the crib with gasoline and setting it on fire! Telramund (Wolfgang Koch) is a big bully, manhandling Elsa throughout Act One. At one point, poor Elsa is threatened with immolation a la Joan of Arc at the hands of Telramund, only to be saved in the nick of time by the arrival of Lohengrin. The townspeople are also a curious bunch, the men in brown shirts and the women in sneakers and uniforms that recall National Socialist youths - the implication is clear. 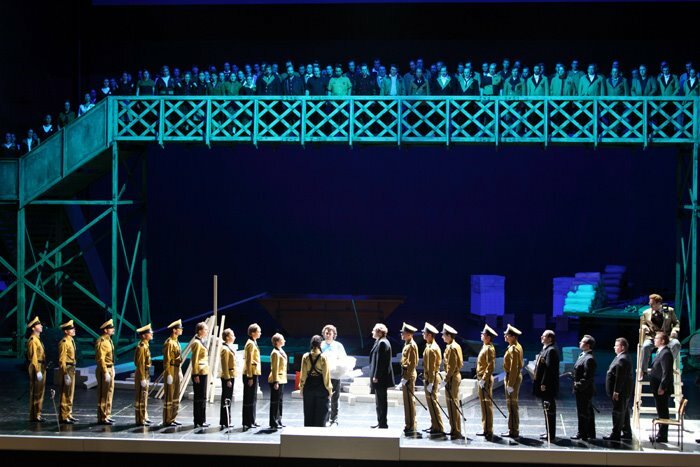 The opera ends with the townspeople sitting on barracks-like long tables, each drawing a pistol pointing to the mouth, a mass suicide that is both unnecessary and gratuitous. It's no wonder that the vociferous booing at the end was targeted for Mr. Jones. To be sure, protests of concept productions in European houses are par for the course. Yes, opera houses should not be museums and it is imperative to re-think and make historical works relevant to the 21st century audiences, but it is also important that such re-imaginings not go against the music, and the overall spirit of the work. If the production was not to everyone's taste on July 8, the musical side of things received only kudos. To my eyes and ears, Jonas Kaufmann is simply the finest heldentenor since Jon Vickers. His timbre is reminiscent of the great Canadian, except Kaufmann has a more secure high register. Kaufmann embodies the role of Lohengrin fully. His In fernem Land was the most poetic I have heard. Arguably the best jugendlich dramatischer sopran to come out of Germany in years, Anja Harteros sang a radiant Elsa on Wednesday, her rich, luminous tone an unalloyed pleasure. She was dramatically powerful as well - this Elsa is no shrinking violet. 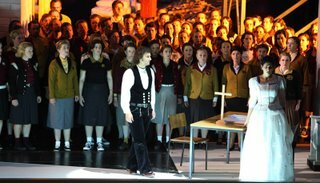 The rest of the cast was almost as good, with Christoph Fischesser a well sung and unusually youthful Heinrich. 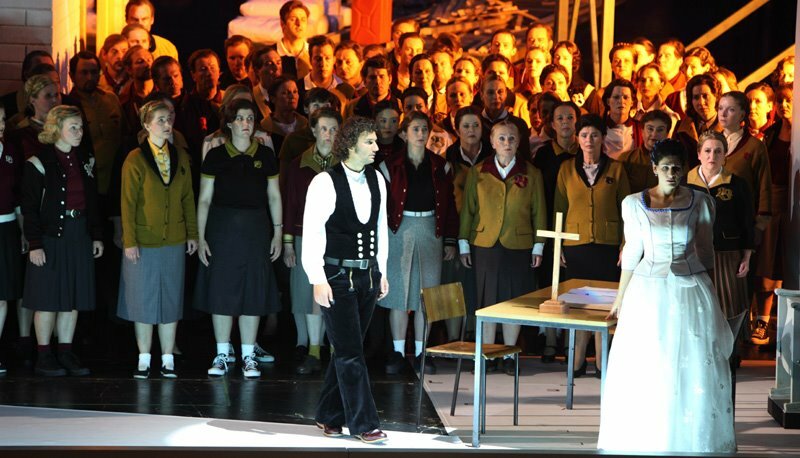 As Telramund, Wolfgang Koch gave an intensely dramatic performance in his interaction with Ortrud. If there was a weak link, it was the Ortrud of Michaela Schuster - her voice is a bit underpowered and her timbre not sufficiently dark and menacing to contrast with Harteros. Schuster was mightily taxed in the final outburst in Act Three. Nagano led the Munich forces in a thrilling performance, perhaps a little too much power at the expense of spirituality. But all in all, this was a most memorable evening at the opera.